Places I've Eaten: YOUR WEEKLY DIGESTION OF FOOD NEWS TO CONSUME....AND BREAD PUDDING LA BOULANGERIE STYLE! 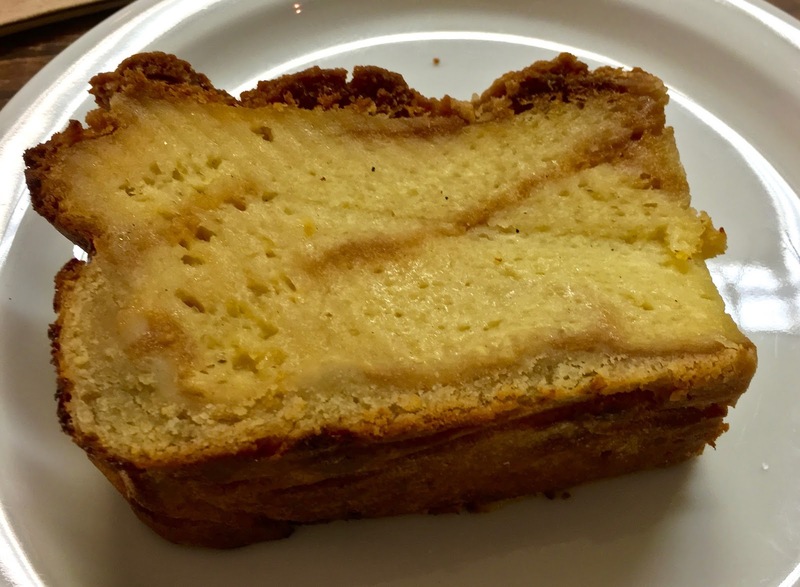 YOUR WEEKLY DIGESTION OF FOOD NEWS TO CONSUME....AND BREAD PUDDING LA BOULANGERIE STYLE! La Boulange was a San Francisco success story that got sold to Starbucks and like most things that get absorbed by larger companies, it then disappeared. But the original owner didn't want to let go and worked out a deal to regain the name and reopen a few of the locations. Thus did Pascal Rigo revive the patisserie to now be La Boulangerie de San Francisco. The first of the locations to re-open is on Pine St. near Fillmore in Pac Heights. To be honest, I had no idea they were there as I'd only followed the whole drama casually. I came across this location on a recent wander through the city. Since there is no time like the present as they say, I stopped in to see what was on offer. It's a small space, but they do have a fair number of sweet and savory things to choose from. I think we all know where I was veering toward. I guess I was intrigued by bread pudding as a loaf cake and had them plate up a slab. The offered to warm it up and I said yes! Things like this are always best served warm to hot. It had that nice pudding like middle with a very nice crunchy crust on the outside. It wasn't too sweet with notes of cinnamon and nutmeg, I think. It had almost everything you think of when having bread pudding. For me, it really could have used some kind of liquid topping--caramel, chocolate, cream, whatever, to get it over that hump to "must have this again" kind of thing. Maybe I'm spoiled, most places I've had this, it comes with some warm sauce ladled over the top. Okay, it is an expectation I guess and doing it this way is much less fuss and mess, plus, you can probably upsell a coffee or cappuccino with it. I do give kudos for the very large and thick slice I got all for $3.75--which definitely meets my desserts with heft need too. If worse comes to worse, one could always get a hunk to go and then just add what sauce trips your trigger when you get it home. And no one will judge you for what you are eating and you can enjoy your guilty dessert pleasure in peace, while sitting on the couch, in your sweats, watching the Food Network. Or maybe that's just me, oh well. It's Super Bowl week and if feel the need to venture into the morass of Super Bowl City, here's a round-up of stuff and places to eat. Bi-Rite just got named one of the nations 25 best small companies. Hopefully they won't get a big head about it. SF Mag says these places don't get much attention though I knew most of them. Check it to see what you know and don't know. This place just opened in the Mission and supposedly they'll be open till 3am on weekends. Maybe this is the start of a real late night food option trend? If they are successful that is. Till then, here is a list of some mostly late night eats in town. Another month, another brewery opening. Though you will have to head to Bayview to try them out. Ugh, the T-Line. And still another SF chef has won Food Network's "Chopped". Might not be surprised to see some it pop up on her menu. The Market on Market (that space in the Twitter building) is re-focusing to be more like Eataly instead of like Whole Foods. Going from one burger space to another, Popson's Burger opens in the former Marlowe Burger. Looks like restaurant rent disputes are spilling over into the East Bay now. Wanna open a night club/performance space in SF? Now is your chance as Yoshi's is on the block--again. Don't order in! Thrillist runs down how to make some of San Francisco's snack food in your own home. Take a look inside Leo's Oyster Bar then take a look at their menu. Here's what is going down food wise for those who live out Richmond District way. This again, Atelier Crenn has dropped tipping and surcharges. We'll see how this works out for them.